The Autumn Air Show on Sunday 14 October closes the air show season in relaxed style. One of the highlights of the Autumn Air Show will be a display by P-51 Mustang Ferocious Frankie alongside Spitfire IX from the Old Flying Machine Company, presenting the might of the Merlin engine in these legendary American and British fighter aircraft. 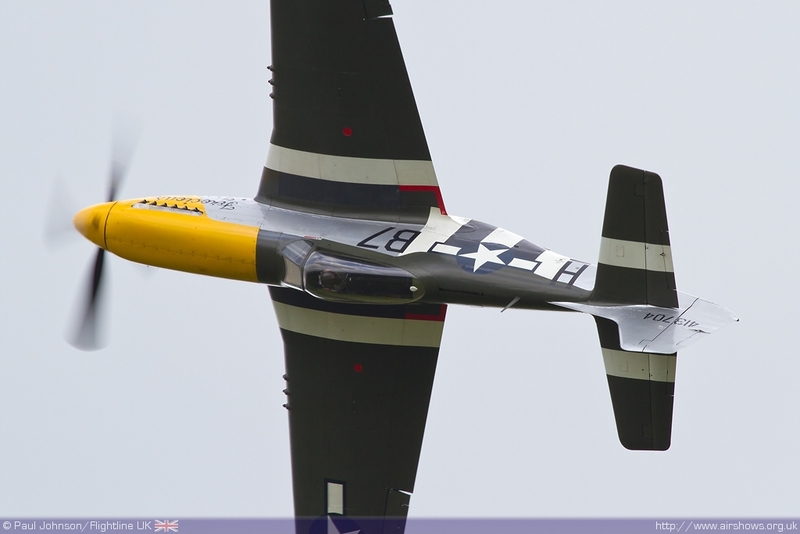 Also flying will be North American TF-51 Mustang Miss Velma from The Fighter Collection. These thrilling displays commemorate the 70th anniversary of the first flight of the Merlin-engine Mustang, a pivotal moment in aviation history which was initiated by events at RAF Duxford. During the SecondWorld War, the Air Fighting Development Unit (AFDU) was based at RAF Duxford. The AFDU provided technical intelligence to the RAF, developing operational tactics and testing captured enemy aircraft. It was a phone call from Wing Commander Ian Campbell-Orde, Commanding Officer of the AFDU at RAF Duxford, to Ronnie Harker, Rolls-Royce service-liaison pilot, which started the sequence of events which would result in the matchless combination of the Mustang aircraft and the Rolls-Royce engine. A subsequent visit to RAF Duxford by Willoughby Lappin, Personal Assistant to E W Hives, Director and General Works Manager at Rolls-Royce, ensured that the proposal was taken seriously and soon thereafter a meeting about the Mustang took place between Rolls-Royce and the Air Ministry. Aftermuch backroom research, performance investigation testing and correspondence between Rolls- Royce, the American Embassy, North American Aviation (the aircraftmanufacturer responsible for the Mustang) and the Air Ministry, the first aircraft was assigned for conversion. This, together with subsequent developments in the aircraft’s propeller and fuel injection, resulted in the definitive American long-range single-seat fighter and an enduringly iconic aircraft that continues to amaze spectators with its aerial dexterity. IWM Duxford air show favourites displaying at the Autumn Air Show include the Black Cats Lynx Pair from 702 Naval Air Squadron, RNAS Yeovilton; the Apache helicopter fromthe Army Air Corps at RAF Wattisham; BAE Systems Hawk from 208 Squadron at RAF Valley; Shorts Tucano fromthe Central Flying School Flight at RAF Linton-on-Ouse; Beechcraft King Air from45 Squadron at RAF Cranwell and the Battle of Britain Memorial Flight Douglas DC-3 Dakota. Showcasing historic aircraft based at IWM Duxford, there will be displays by B-17 Flying Fortress Sally B; North American F-86 Sabre; two Spitfires; two Curtiss P-40 Warhawks and a Goodyear Corsair. Join us for the Autumn Air Show as we commemorate the innovation that led to the formidable Mustang fighter aircraft and celebrate another fantastic air show season at IWM Duxford. There is still time to purchase your tickets in advance to save 10% and get a free child ticket, which is available with every adult or senior ticket purchased. This offer is on advance ticket purchases only; it cannot be used on the day of the event. Tickets can be purchased online at www.iwm.org.uk or by calling the Box Office on 01223 499 353. The Box Office is open from Monday to Friday from 9.30amto 4.30pm. There is no booking fee but a postage and packing fee applies per transaction.